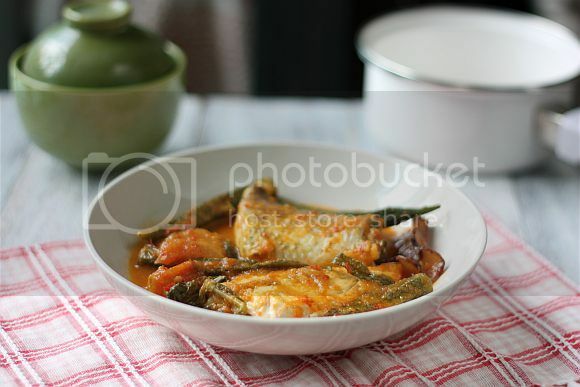 Assam Pedas Fish, or literally "Sour Spicy" Fish is a classic Malaysian dish. 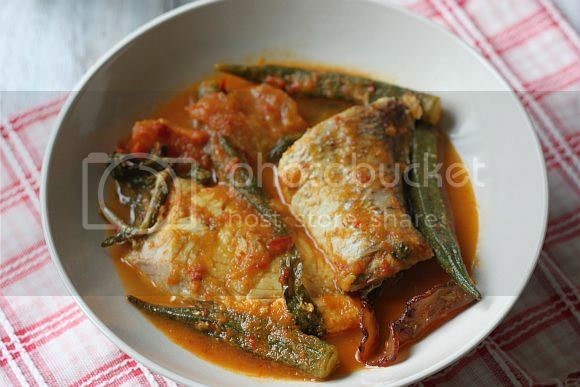 Ask any home cooks in Malaysia--Malay, Chinese, or Indian--and you are bound to get a number of different recipes for Assam Pedas. Everyone has their own interpretation for this favorite dish and there are endless adaptations; suffice it to say, it's sour, fiery hot, and tastes extraordinarily satisfying. 1) Pound the spice paste with mortar and pestle or grind them in a food processor. Set aside. 2) Soak the tamarind pulp in warm water for 15 minutes. Squeeze the tamarind pulp constantly to extract the flavor intto the water. Drain the pulp and save the tamarind juice. 3) Heat oil and fry the spice paste for 2 minutes or until fragrant. 4) Add the tamarind juice, fish curry powder/turmeric powder and bring to boil. 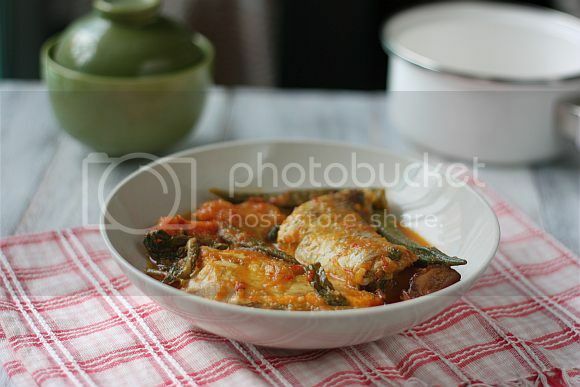 5) Add the tomato wedges and okras and bring to boil. 6) Add the fish, salt, and palm sugar/sugar. 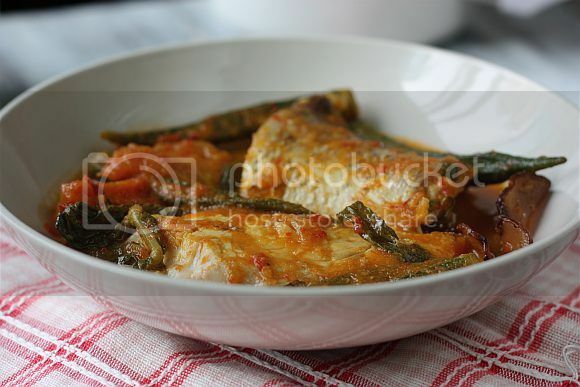 7) Simmer on low heat for 5 minutes or until the fish is cooked. Serve hot with white rice. I just had curry fish head over the weekend and was thinking I wanted to try cooking it at home. Seeing this, I changed my mind. Kiving! Tamarind is such a great ingredient to pair with fish. It's perfect for fish stews too. So sour! Yum. Gorgeous recipe. Hope all is well! Made it today and loved the dish. Balvinder, so glad that you liked the dish.